Years ago on my honeymoon, playing volleyball in the beach in Ko So Moi in Thailand, I was told I tore my ACL and would need surgery. Fortunately I visited Dr. Jordan Metzl, and he helped me heal without surgery. To this date, I do some exercises that help me keep my knees strong. Dr. Metzl has helped me for years to learn how to heal myself from athletic injuries. Dr. Metzl just came out with a book, “The Athlete’s Book of Home Remedies,” available on Amazon, and I wondered if it would live up to his excellent guidance in person. Then yesterday I develop a deep pain in my heel – on the bottom of my foot, and couldn’t walk. I thought I would have to visit Dr. Metzl but I looked at the book just in case. Within minutes I followed his guidance, and started getting on the road to recovery following his advice, and building on it with a very good video from YouTube that further elaborated on exercises to overcome plantar fasciitis. I highly recommend Dr. Metzl’s book – it is comprehensive, easy to read, and a real solid resource. 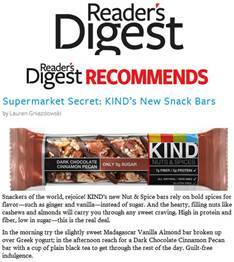 Reader’s Digest calls the snackers of the world to rejoice in the release of KIND’s new Nuts & Spice bars! The bars’ bold spices, like vanilla and ginger, deliver great taste without the need for added sugars. 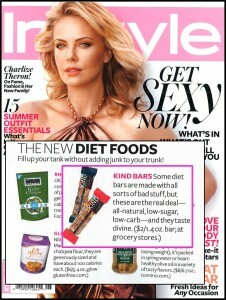 The editors recommended Madagascar Vanilla Almond and Dark Chocolate Cinnamon Pecan as their favorite guilt-free indulgences to get them through the day. 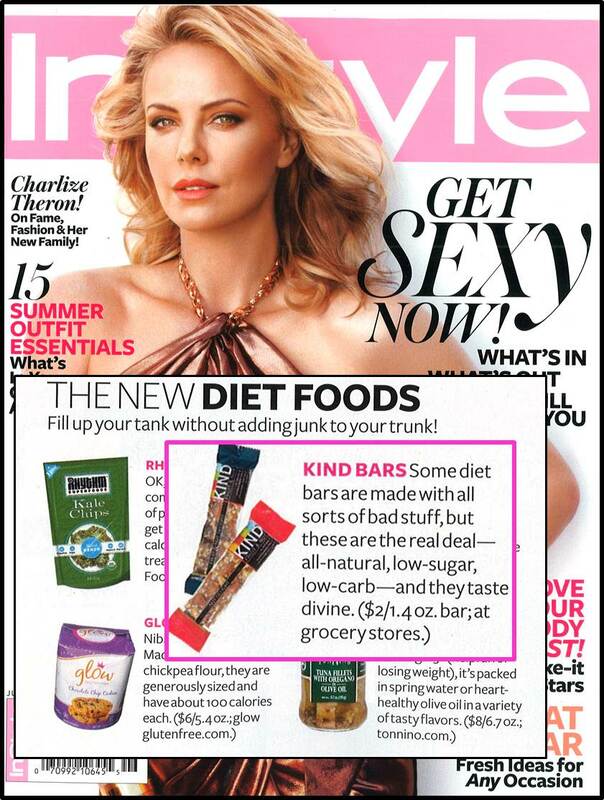 This June, InStyle recommends KIND as a snack that will “fill up your tank without adding junk to your trunk.” InStyle loves KIND for being “the real deal – all-natural, low-sugar, low-carb – and they taste divine.” It seems like InStyle has really raised the bar on how to slim down for the summer! Check out these stunning images of Kate Moss dripping in Maiyet! The article below by Ron Pundak contains at least two deep lessons. The clearest one is of course what he shares: that “anti-normalization” efforts that seek to boycott any cooperative efforts and engagement among Palestinian and Israeli civil society organizations and people can only bring harm to the people of the region who want to resolve the conflict, to end the occupation, and to achieve a two state solution. But there is a deeper lesson I must confess to. Until reading this article, my attitude has been to defend efforts like those of OneVoice, which clearly works to end the occupation, to change the status quo, and to achieve Israeli-Palestinian agreement. I have quietly acquiesced to, and empathized with, Palestinian concerns about “dialogue” groups whose effort is just to humanize the other, understanding that Palestinians may not want to “dialogue” with the enemy – they want to end the occupation and do not want to endorse the status quo in any way. I still of course understand this. But I now also recognize that is a cowardly position, convenient to me because that is the approach I feel is worthy of support as that is what OneVoice does. But it fails to stand up to defend and recognize that those “dialogue” efforts are also vital to fostering understanding and respect of the “other”, and that often Israelis and Palestinians are first exposed to the other side through these socio-cultural groups and in a very direct way may then be inspired to get more involved in changing the status quo because of the human bonds that they have established. The same thing happened to me, if I go back to 1989, when I was a student at Hebrew University and I met Palestinian students whose humanity I began to appreciate more. While 71% of the Israeli public favors holding peace negotiations between Israel and the Palestinian Authority, 67% do not believe that negotiations will lead to peace in the coming years, according to the April 2012 Peace Index survey of the Evens Program for Conflict Resolution at Tel Aviv University and the Israel Democracy Institute. 58% said they did not believe there is a real chance to resolve the conflict in accordance with the "two states for two peoples" formula in the next ten years. Did Marco Polo steal pizza from Korea? Clifford May wrote an article worth reading for all those who are determined to truly address the refugee issue and resolve the Arab-Israeli conflict. In addition to the points made in the article, it is important to track the real numbers of refugees, EVEN if I you count their descendants. Some of the estimates regularly shared are inflated beyond belief. A way to confirm this is simply by tracking how many Palestinians were living in total prior to 1948, then tracking how many of them left and how many of them stayed at the time, and how many are there today, and compare to the estimated number who is considered a refugee today. Even if everyone who left, and everyone of their descendants were to considered a refugee, and even if their birthrate was far higher than the one in the West Bank and Gaza and within Israel, the discrepancies would still be quite apparent. My father, Roman Lubetzky, was a rarity among survivors of concentration camps. Most of his fellow survivors either were immersed in the horror of the Holocaust and sadly embittered by it, or were determined to shut it out of their lives and never again talk about it. My Dad would talk about it to anyone who would listen, and would reignite suffering as he recounted his experiences as a little kid from 9 when the war started to 15 when he was rescued from Dachau. And yet he always talked about it with humanistic positive hope for the future, emphasizing the importance of building bridges and preventing the suffering of any human being. He taught me compassion for the Palestinian cause, just as he was a fervent believer in Israel as the one homeland of the Jewish people. Ziad Asali, whose latest article is here, is among the very few people I have ever met who reminds me of the moral courage that my Dad had – to proudly wear his historic pain on his shoulders, not to recriminate and as a way to guilt others, but as a responsibility to forge a better way for his people and for humanity. Most Palestinians and Israelis would want to move on with their lives and would accept a two state solution. But not enough people take it upon themselves to bring it about. In the meantime, passionate minorities with far more extremist perspectives – that would deny the right of the other side to freedom, dignity, respect, security, and a State of their own – take it upon themselves to speak loudly – as often evidenced by those who take the time to express mean comments on these boards, from either extreme side. Only if people like Ziad Asali lead the way will this conflict and the suffering that comes with it come to an end. Anything other than a two state SOLUTION is just an illusion that will condemn those who live there with continued hatred and war.